The US fertility rate dropped in 2017. The current downward trend in the US fertility rate would be troubling if strong growth and economic confidence required a larger workforce. But the evidence linking births with economic performance in developed countries doesn't add up, and America has nothing to worry about. News that the United States’ fertility rate fell in 2017 to 1.75 has provoked surprise and concern. A buoyant US economy in the 1990s and early 2000s was accompanied by fertility rates of 2.00-2.05 children per woman, up from 1.8-1.9 in the 1980s. But the increasingly strong economic recovery of the last five years has been accompanied by a declining birth rate. That seems to presage a long-term shortage of workers relative to retirees, and severe financial pressures on pension funds and health-care provision. But the assumption that stronger growth and economic confidence must generate higher fertility – with low birth rates reflecting pessimism about the future – is not justified by the evidence. Moreover, fertility rates at around the current US level do not pose severe problems – and bring some benefits. In all major developed economies, fertility rates fell during the 1960s and 70s, reaching levels below the replacement rate of around 2.05 children per woman. The US rate reached 1.77 in the late 1970s, compared to 1.8 in Northern Europe and 1.65 in Western Europe. And while we cannot be certain, the best expectation is that this shift to fertility rates significantly below the replacement rate will prove permanent, with temporary reversals driven by specific one-off factors. Some viewed the US return to somewhat higher fertility rates in the 1990s as the consequence of greater economic dynamism and confidence, in contrast to “old Europe.” But throughout the last 30 years, fertility rates for white and black Americans have remained significantly below replacement level, and the three-decade rise and fall of US birth rates is explained primarily by higher Hispanic fertility, reflecting the common phenomenon that first-generation immigrants’ fertility rates are typically similar to those in their poorer countries of origin. The same effect explains why Canada – with immigration skewed toward low-fertility Asian countries of origin – has had a significantly lower fertility rate of around 1.6. But with Latin American fertility rates now in steep decline – Mexico’s is down from 2.9 in 2000 to 2.1 today, and Brazil’s has fallen from 2.5 to 1.7 – the immigrant-induced effect is disappearing, and the US is reverting to a typical fertility rate for a rich developed country. Absent temporary migration-induced effects, all major developed economies have shifted to fertility rates of 1.2-2.0, with most falling between 1.3 and 1.9. And while there is some evidence that sudden deep recessions produce temporary fertility dips, followed by rebounds, cross-country comparison provides no evidence of any correlation – positive or negative – between medium-term economic success and precise fertility rates within this range. Canada, with its lower fertility rate, is quite as successful and confident as the US. Strong German growth over the last 20 years has been combined with a fertility rate of 1.4-1.5, well below the 1.98 rate in less successful France. South Korea has maintained economic expansion with a fertility rate of just 1.2-1.3. Latin America’s most prosperous economy, Chile, has a fertility rate of 1.76, well below less successful Argentina’s rate of 2.27. 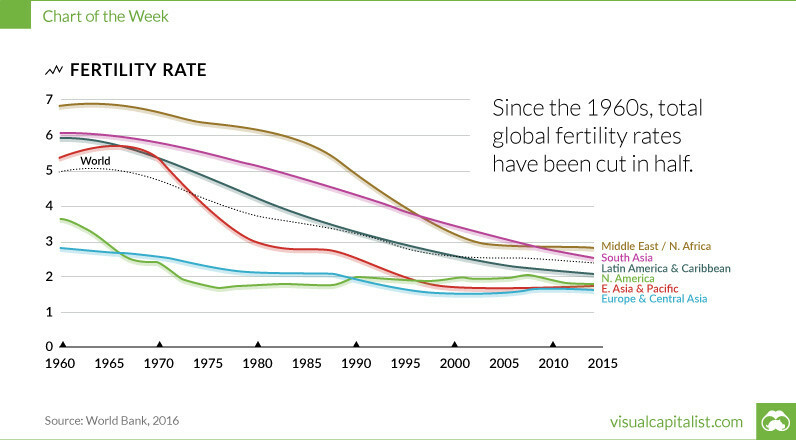 The recent decline in US fertility is therefore unsurprising; and, provided it does not fall to much lower levels, there is no cause for concern. Of course, in the long run, a lower fertility rate, combined with rising life expectancy, will produce a higher ratio of those over 65 years old to those conventionally labeled as “working age.” But as people live longer and healthier lives, retirement ages can and should be increased. And in a world of radical automation potential, which threatens low wage growth and rising inequality, a rapidly growing workforce is neither necessary nor beneficial, and a slightly contracting supply of workers may create useful incentives to improve productivity and support real wage growth. Notably, fears that robots will take jobs are much less prevalent in Japan and China than in higher-fertility Western countries. In rich developed societies with modern attitudes to the role of women, fertility rates somewhat below replacement levels may thus be both inevitable and broadly welcome. But degree matters, and extremely low fertility, such as Japan’s rate of 1.4, will create major problems if permanently maintained. The United Nations median projection suggests that the total population of North and South America, after growing by another 15-20% between now and 2050, will remain roughly stable for the rest of the twenty-first century. By contrast, Japan’s population is projected to fall from 125 million today to around 80 million. Demographic contraction on that scale will severely stress Japan’s ability to support an aging population. Intelligent policy should therefore identify and remove any barriers unnecessarily depressing birth rates, such as labor-market discrimination, limited parental leave, or inadequate childcare facilities, which make it difficult for women to combine careers with having as many children as they wish. The Scandinavian countries are exemplary in this respect, though fertility rates there have not returned to replacement levels, but only to about 1.75-1.9. Similar policies in the US might marginally increase the fertility rate from today’s 1.75, with a mildly beneficial net effect. But the predominant response to America’s recent fertility decline should be to accept it as inevitable and to stop worrying about it.